The rudimentary ethos won't suit everyone but if simple is your thing, here's a very cool-sounding place to start. Stripped back Cabronita-style looks. Fresh tones. Excellent feel. The rudimentary set-up isn't for everyone. 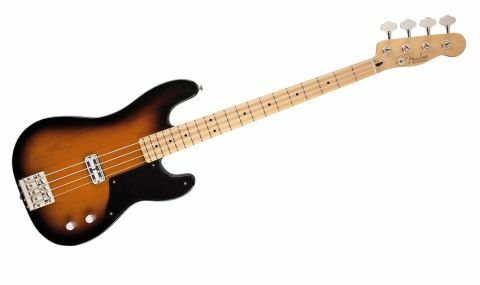 With the whole team totally smitten by the Cabronita series, it's only right that we take a look at the Precision Bass version. The basic shape comes from the original 50s model with an all-maple neck, Tele-style headstock and now with an alder body. "With the addition of the Fender Hi-Mass Bridge and a Gretsch-style Fideli'Tron humbucking bass pickup it offers a fresh approach"
The design worked then and it works now, but here with the addition of the Fender Hi-Mass Bridge and a single Gretsch-style Fideli'Tron humbucking bass pickup it offers a surprisingly fresh approach. In keeping with the classic vibe of the instrument, the tuners are reverse action open-gear types: absolutely the right choice with this headstock shape. Add the usual Cabronita touches of a small one-ply scratchplate, surface-mounted controls and edge-mounted jack socket, and you have something that looks and feels really special. The only body contouring is a very welcome forearm chamfer, which helps to prevent your arm going dead during long sessions! So, how different does it sound compared with the regular model? Well, it's slightly more tonally 'compact' but surprisingly full and fruity with a very pleasing tendency to growl if you play hard. It actually falls rather neatly between the sound of the original single-coil P-Bass and the later split- coil so effectively it offers an entirely new sonic stamp. While the sound is clean, it's never thin, while the output level is high and it projects really well: absolutely no complaints at all. This bass fits beautifully into the current Cabronita experience and will delight most players. It sounds great, the weight is reasonable and the general feel is excellent, although the predominantly slab body won't appeal to all.